Fall is here. Cooler temperatures, raking the beautiful fall leaves from our yards, the shorter days and longer nights, the morning chill and the afternoon warmth, and the importance of pumpkin patches and black cats take center stage. It’s an amazing time of year for change. Fall is also the perfect time of year to take your vehicle in for a check-up. Just like you go annually to the doctor to make sure all is well, your car or truck needs a professional mechanic to make sure everything is functioning properly as well. It’s important not to skip your annual routine maintenance checks. Leaks and spills can be caught early before they become major problems that leave you stranded on the side of the road, needing roadside assistance from Lee’s Towing, Northern Colorado and Wyoming’s premier tow truck company. Still not convinced? Lee’s Towing lists the reasons below for routine vehicle maintenance. Longevity. 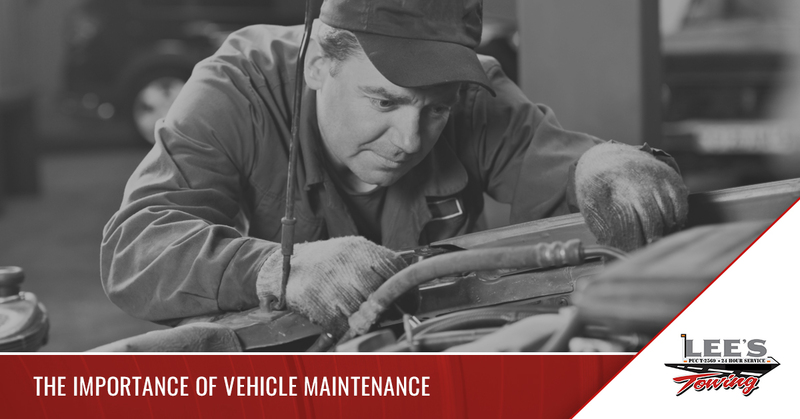 If you want your car to last you a while, routine maintenance is key. Maintaining your car will prevent major problems in the long run. Regularly check the fluid levels, tire pressure, air filters, lights, brakes and battery. Safety. Safe driving is usually related to the condition of your car or truck. For example, properly inflated tires will prevent blowouts and flat tires and rotating your tires will keep the wearing even, an important safety precaution. Running smoothly. The importance of fluids cannot be overstated, especially oil. Oil is the life of your engine, the powerhorse of your vehicle. Oil is needed to keep all the parts running smoothly and efficiently. Transmission fluid is another component that is essential to the running of your vehicle with no hiccups. If you want your car or truck to keep moving, you’d better have proper levels of transmission fluid. Better gas mileage. When your tires are properly inflated and everything is working as it should, your car or truck is more efficient. This translates to your vehicle having to work less to do the same job and more money added to your pocket. Trade in value. Let’s face it: when you’re looking at used vehicles, you want a well-maintained, nice-looking, reliable car. If your vehicle is beat up or needs major issues fixed (such as engine repair or replacement and transmission repair), you won’t get a great trade-in on it when you do want a new vehicle. Maintaining your vehicle is not a lot of work or expense on your part, but it pays much more in the future. It prolongs the life of your vehicle, makes it safe to drive, allows your vehicle to run smoothly, gets better gas mileage, and maintains its value. It’s not a lot of time versus your alternative: calling Lee’s Towing 24 hour roadside assistance for a tow service. Serving Northern Colorado and Wyoming, Lee’s Towing offers light duty towing services, heavy duty towing services, and impound services. We also are HAZMAT towing certified and a local commercial towing company. We pride ourselves on offering the best roadside assistance and towing services with friendly, reliable, and professional staff who work hard to exceed all of your towing needs. Contact Lee’s Towing today!